A quiet campus at Eastern Mennonite University? Not at all, especially this summer, with outside groups and auxiliary programs stretching the facilities non-stop from early May through mid-August and several major capital improvement projects happening simultaneously. The biggest project: what is being called “Phase II” of the University Commons, a $2.4 million funded project that will largely benefit and enhance fine arts programs at EMU. 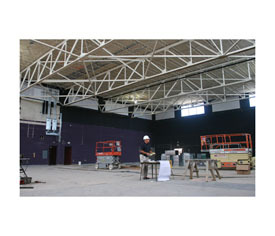 The former student center/gymnasium attached to the south end of the Commons is being turned into a 200-seat mainstage theater. The new facility will offer tiered seating, new dressing rooms and costume shop and more storage space. This fall’s mainstage theater production, the musical comedy, “The Triumph of Love,” will be presented mid-October in Lehman Auditorium while the Phase II work continues, with completion slated for November this year. Adjacent to the new mainstage theater will be the Lee Eshleman Studio Theater for smaller, more intimate performances. The facility is being named in honor of Lee Eshleman, a 1986 art graduate who teamed up with Ted Swartz as the actor-playwright duo, Ted & Lee, for 20 years until Eshleman’s death in 2007. The student-run Common Grounds coffeehouse will remain at its present site in the Commons but is being enlarged with a built-in stage area and special lighting. It will also be air-conditioned and handicap-accessible. Second floor of the Phase II Commons project will feature an advanced media lab for the VACA (Visual and Communication Arts) program. The 25′ by 45′ room will have 15 work stations with state-of-the-art equipment for video/audio editing and advanced digital imaging. Across Park Road from the Commons, Elmwood residence hall is being completely renovated, with its companion, Maplewood to follow once Elmwood is completed by Christmas this year. Both buildings opened in 1963 and “are sorely in need of major improvements,” according to C. Eldon Kurtz, director of physical plant at EMU. Improvements to both buildings will feature environmentally-friendly heating and cooling systems, modernized safety features, improved natural and artificial lighting, expanded lounge areas serving each floor, and new exit stairs and elevators in each building. Both three-story buildings will each accommodate 85 students. Once Elmwood is completed, attention will focus during spring semester 2011 on a similar renovation of Maplewood residence hall, with anticipated completion the summer of 2011. “When Maplewood is completed, Elmwood and the new Cedarwood residence hall that opened last fall will make up a ‘Woods Quad’ with an arched window motif and pitched roofs and shingles for visual continuity” with other major buildings on campus,” Kurtz said. “We are working to obtain LEED (Leadership in Energy and Environmental Design) certification from the U.S. Green Building Council on both Elmwood and Maplewood at least on the ‘silver’ level,’ Kurtz added. Harman Construction Company of Harrisonburg is general contractor for the Phase II Commons project and $6 million residence hall renovations. – Installing an additional emergency alerting system that uses the 91.7 FM radio frequency. This system provides instantaneous message delivery with audible alarm and serves as another technology reinforcing existing alert systems. – Implementing a uniform campus-wide key system, beginning with the University Commons. Even as these projects go forth, EMU has hosted an estimated 6,000 persons this summer for events ranging from 2,000 cyclists for a “BikeVirginia” event, numerous sports camps, an interfaith peace camp, several church groups of 500-600 people and the annual Blue Ridge Running Camp. Story by Jim Bishop. Jim can be reached at bishopj@emu.edu.